As Indiana basks in the afterglow of its 2016 bicentennial celebrations, the state’s historic sites are on full display. This state boasts a surprisingly rich history with hundreds of landmarks, significant homes and historical downtown districts. 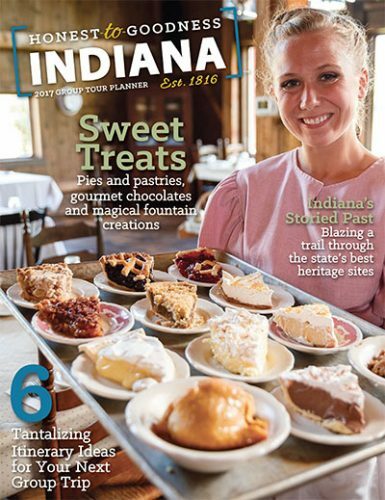 From north to south, here’s a sampling of what to include on your next Indiana tour. In the small town of Fountain City you’ll find the Levi Coffin House State Historic Site. As conductors for the Underground Railroad, Levi and Catharine Coffin helped more than 2,000 freedom seekers to safety. 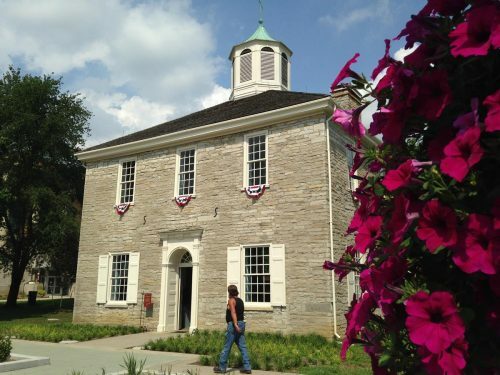 A brand new Interpretive Center is the centerpiece of Indiana’s Underground Railroad history. From the outside the house looks like a normal brick home from the 1830s. On the inside, however, most rooms have at least two ways out. There is a spring-fed well in the basement for easy access to water, plenty of room upstairs allowed for extra visitors and a large attic for convenient hiding places. The house’s location on a major thoroughfare allowed the entire community to act as lookouts when bounty hunters came into town. 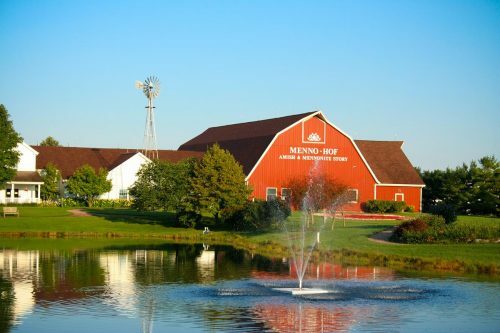 Located in the heart of Amish Country, Menno-hof in Shipshewana is a great way to learn about the history of the Amish and Mennonite people. A short film precedes a self-guided tour where guests trace the heritage of the Anabaptist movement from Europe to America through 24 different venues. Anyone looking to brush up on their family history should visit the nation’s foremost genealogical library in Fort Wayne. The Genealogical Center at the Allen County Public Library is conveniently located in the heart of downtown. Whether you’re a family historian or just curious about your origins, the library has the most extensive collection of research materials available to the public in the United States, and eight on-staff genealogists are available to guide your research. Indiana was a major player in the Industrial Revolution with automakers across the state churning out thousands of cars for hungry consumers. 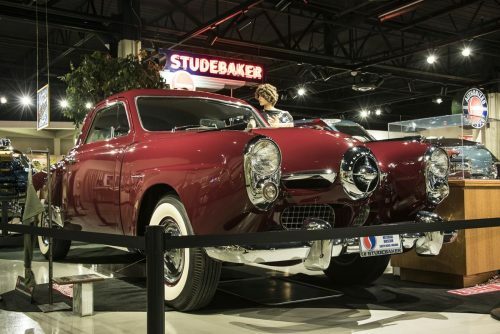 At the Studebaker National Museum in downtown South Bend, three floors of exhibits trace the history of the company from 1852 to its demise in 1966. Before automobiles, the company had its roots in the horse and carriage industry, and carriages from four presidents are on display, including the one Lincoln rode to Ford’s Theatre on that fateful night. At the adjacent Oliver Mansion, visitors can tour the beautifully preserved 38-room home and grounds of industrial titan Joseph Oliver. The mansion is unique in the fact that so many original furnishings are on display. Any visit to South Bend wouldn’t be complete without a tour of the University of Notre Dame. This iconic school of higher learning has a storied 175-year history of academic and athletic achievement. Guided campus tours are available. 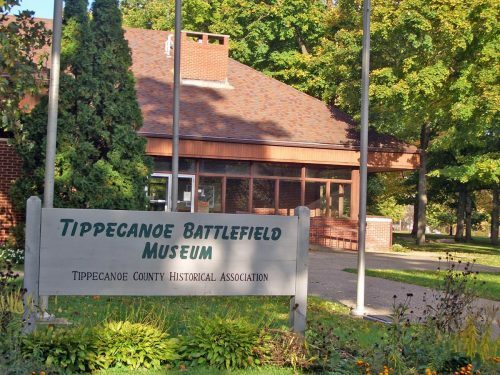 In West Lafayette, the Tippecanoe County Historical Association offers guided visits through the Tippecanoe Battlefield museum and memorial. The association also helps host the Feast of the Hunter’s Moon, an annual festival that recreates an 18th century French trading village. Nearby, Prophetstown features a fully functional farm with farmhouse modeled after a 1920 Sears & Roebuck kit house. 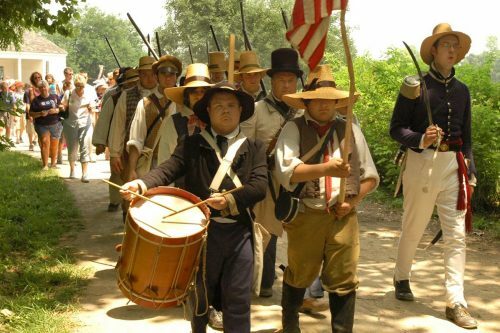 Take the short drive or hike out to this recreated town, which was a Native American settlement before William Henry Harrison, the first governor of the Indiana Territory, burned and looted the original. Noblesville has many notable buildings. The impressive Hamilton County Courthouse (circa 1879) has played host to famous visitors including Theodore and Franklin D. Roosevelt. The J. J. Heylmann & Sons building was constructed in 1898 to manufacture wagons and carriages. Its storefront features an overhead door, used as a passage for vehicles manufactured there. In its heyday the Grand Hotel was a place where people of status stayed; each room had its own individual fireplace. Today it’s home to the Noblesville Clock Company. Just north of Indianapolis is Conner Prairie. Spanning 800 acres, this is one of the most visited outdoor museums in the country and Indiana’s only Smithsonian affiliate. Created by Eli Lilly in 1934, this nationally acclaimed living history museum fulfills its mission by encouraging visitors to explore Indiana’s heritage through hands-on, immersive and interactive experiences that hark back to the 1800s. In Indianapolis, the Benjamin Harrison Presidential Site was the home to our nation’s 23rd president. Docents guide 75-minute tours for groups of 10 or more with highlights including presidential china and Harrison’s study, which is filled with personal belongings from his White House years, including his Oval Office desk. Groups in Indianapolis also enjoy the well-preserved Victorian home of famed poet James Whitcomb Riley. Riley lived in the house for the last 23 years of his life and it’s been open to the public since 1922. The home features the same furnishings and ornate décor Riley enjoyed during his lifetime. Visitors will see beautiful ceilings painted by Italian artisans and the desk where he penned well-known poems such as “Little Orphant Annie.” The recently added visitors center features a documentary video. The Indianapolis City Market is a historic public market. Founded in 1821, it’s been at its current facility since 1886. The building, a National Historic Landmark, is a one-story, rectangular brick structure trimmed in limestone. The farmers market operates just outside, and there is a catacomb tour that takes visitors below street level. Indianapolis has more historical memorials and monuments than any city outside of Washington, D.C. Notables include the Soldiers and Sailors Monument and Memorial, located in the middle of traffic in downtown’s Monument Circle. 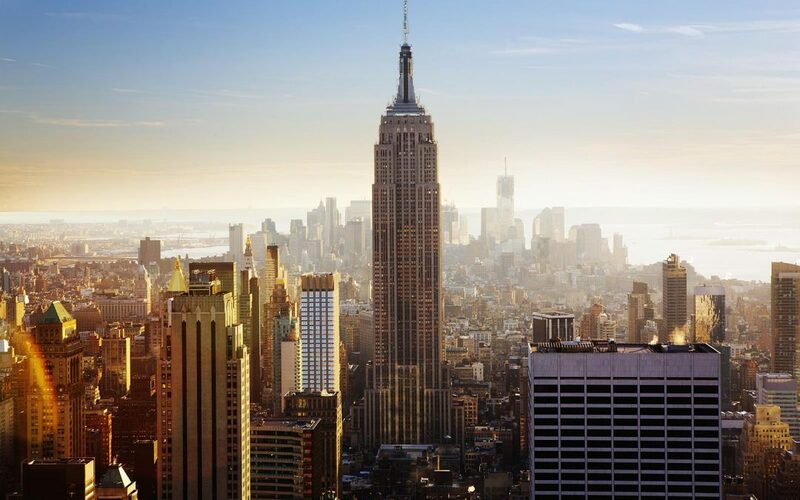 Honoring those who served in the Revolutionary War, War of 1812, Mexican War, Civil War, Frontier War and Spanish-American War, it has an observation deck accessible via elevator or 333 stairs. Other memorials include the Indiana World War Memorial and Museum, Project 911 Memorial, Congressional Medal of Honor Memorial and the beautiful American Legion Mall that stretches over two blocks of downtown. The Indiana State Museum in Indianapolis is located right on the Indiana Central Canal. Exhibits focus on the state’s geological history, famous Hoosiers and cultural contributions of Indiana. 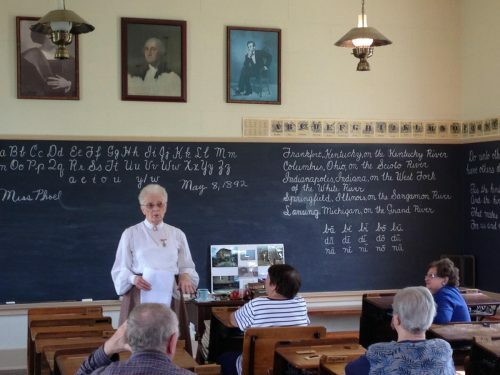 A fun peek into yesteryear is found at the One Room Schoolhouse in the community of Pittsboro in Hendricks County, just west of Indianapolis. A volunteer schoolmarm takes guests back in time to a typical day in 1892 and treats each participant as if they were one of her students. Each tour member is given the name and desk of real 1892 students with boys and girls separated at recess time. 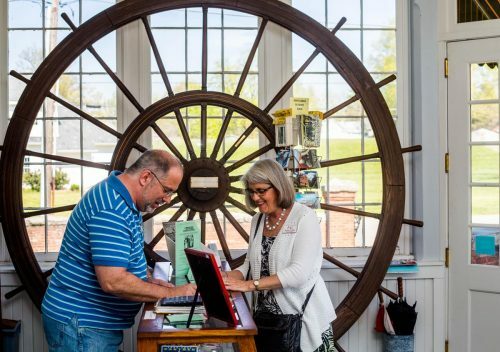 Pair this with a guided tour at the Hendricks County Museum, the former sheriff’s residence and jail. The first settlements were in the southern part of the state, with notable landmarks displaying the state’s proud heritage. Founded in 1732, historic Vincennes is Indiana’s oldest city. When Congress created the Indiana Territory in 1800, Vincennes was its capital. This is where Indiana had its beginnings: where Chief Tecumseh walked, where troops mustered for the Battle of Tippecanoe and where William Henry Harrison, the first governor of the Indiana Territory and ninth president of the United States, lived. Today, visitors can tour the Indiana Territorial Capitol (1805), the state’s first higher learning academy (Jefferson Academy), a print shop and military post. Grouseland, the William Henry Harrison Mansion and Museum, is the two-story, red-brick home built for Harrison during his term as governor. 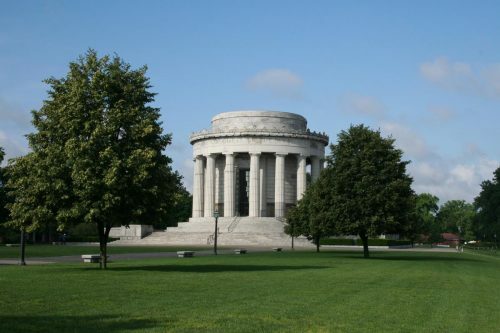 Also in Vincennes is George Rogers Clark National Historical Park, which honors the heroic colonel who defeated the British on the northwestern frontier during the Revolutionary War. While the center of government is now in Indianapolis, Corydon holds the honor as first state capital of Indiana. Located on the town square, the Old State Capitol, a boxy limestone building with a stately cupola, opened in 1816 as a courthouse and the first capitol of the 19th state of the Union. The House of Representatives met on the first floor, the Senate and Supreme Court on the second. A tour can include two historic buildings across the street – the Coburn-Porter Law Office and Gov. Hendricks’ Headquarters, used as a residence by Indiana’s second governor, William A. Hendricks. 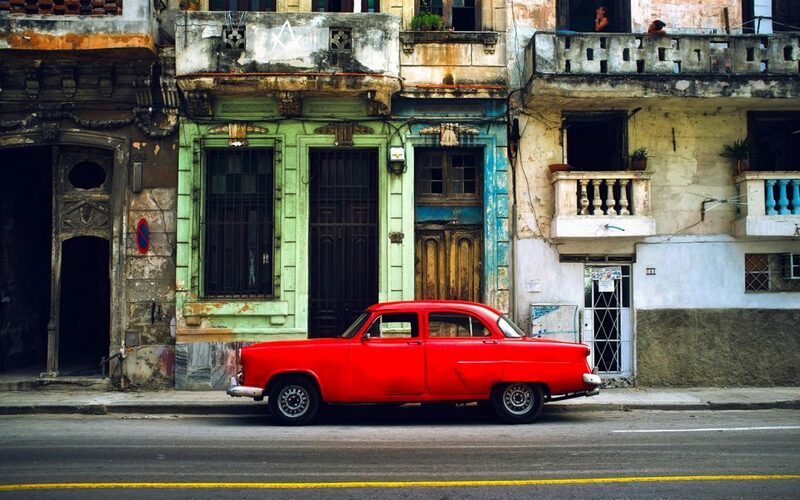 is a thriving district with shops selling antiques and collectibles, sweets, fine art and books. 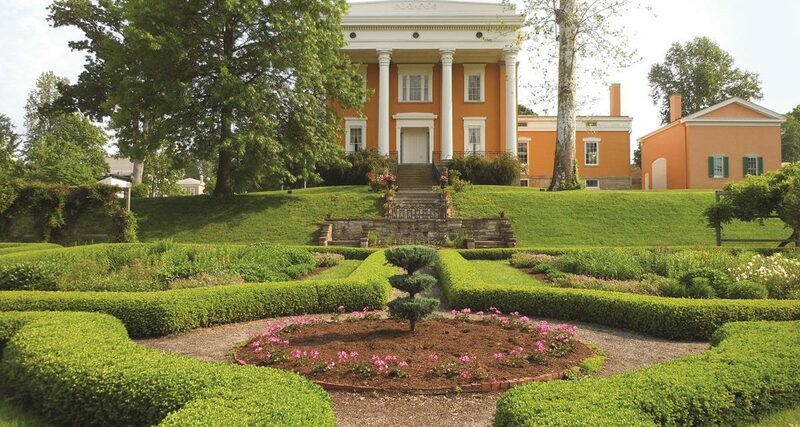 The crown jewel of Madison’s historic district is the 1844 Lanier Mansion, one of finest examples of Greek Revival architecture and a National Historic Landmark. Its four immense Corinthian columns support a two-story porch overlooking a garden and the Ohio riverfront. Overlooking the Ohio River in Aurora is another must-see mansion, Hillforest Victorian House Museum, where the family of industrialist Thomas Gaff lived from 1855 to 1891. The Italian Renaissance-style home, also a National Historic Landmark, is notable for its nautically themed architecture, including a third-floor belvedere that resembles a pilot house. Luncheons are available for 20 guests or more. Following the Ohio as it flows southwest leads to Howard Steamboat Museum and Mansion in Jeffersonville, across the river from Louisville. Groups can see exhibits on the steamboat era, including models, paintings and tools, and admire richly carved pillars, mantle-pieces and railings in this 1894 mansion. The family-owned Howard Shipyards (1834-1940) were just steps from the home. Culbertson Mansion State Historic Site is part of Mansion Row in New Albany, also across from Louisville. Groups can arrange lunch or tea in the formal parlor of this 1867 Victorian home, a French Second Empire beauty with Gilded Age grandeur including elaborately stenciled ceilings. Step way back in time – how about 390 million years – at the Falls of the Ohio State Park & Interpretive Center in nearby Clarksville. Learn about ancient fossil beds with more than 500 species of coral and prehistoric ocean life. Exhibits and a film tell about Lewis & Clark, who in 1803 prepared for their expedition from this area. In the Ohio River city of Evansville, tucked in the southwestern corner of Indiana, you’ll find the Reitz House. A High Victorian showplace in the heart of downtown’s Riverside Historic District, it was built in 1871 for the Reitz family, who were Prussian immigrants and philanthropists. Stained glass, ornate plaster-work, walnut wainscoting and woodwork adorn the mansion, with most furniture original to the family. The Moorish-design grand entry hall and 14-foot ceilings are impressive. The USS LST-325 Ship Memorial is moored on the Evansville riverfront. This piece of military history is now a museum. LST stands for Landing Ship Tank, an amphibious vessel that delivered tanks, troops and supplies directly onto enemy shores. Launched in 1942, it made over 40 trips between England and Normandy. It’s one of only two World War II LSTs to be preserved and the only one still in operating condition. Angel Mounds, another Evansville attraction, is one of best preserved Native American sites in the U.S. Located on the banks of the Ohio River, this state historic site includes a new visitor center, reconstructed winter houses, a roundhouse, a temple and portion of a stockade wall. For nearly 350 years up to 3,000 people occupied the site, which included 11 earthen mounds built as platforms for elevated buildings. The site was abandoned before European settlers came to America. 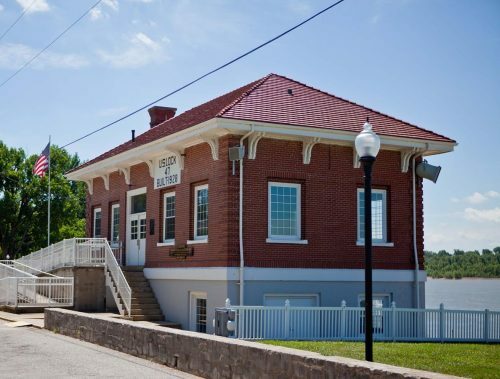 Perched on the banks of the Ohio River just east of Evansville, Historic Newburgh was originally settled in 1803. 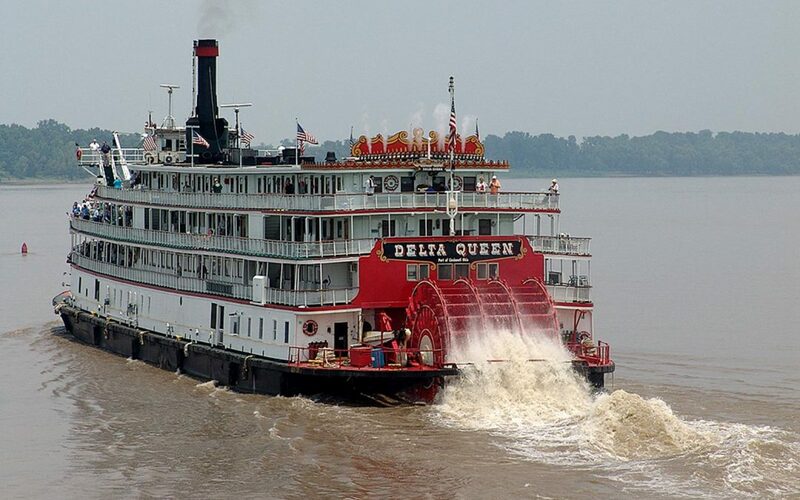 By 1850 the community became the largest river port between Cincinnati and New Orleans and in 1862 it was the first northern city captured by the Confederate army. Newburgh is a model for Main Street redevelopment, with unique shopping, dining, sightseeing, festivals and events. Actor-led seasonal ghost walks transport guests back in time to relive the haunting tales of Newburgh’s past. Historic New Harmony, west of Evansville, is the site of two early 19th century utopian communities. 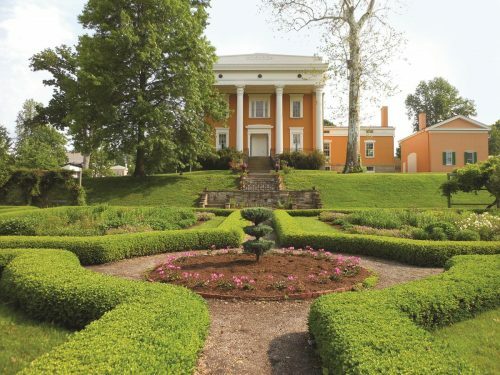 The University of Southern Indiana maintains historic sites and facilities that include the 1824 Community House #2, which served as a dormitory for men and women, the Beal House (circa 1815) and the Opera House. An architecturally acclaimed visitor center houses exhibits on the communal history of the area. The Labyrinth in New Harmony stands proudly on Main Street. It was originally designed as a place for meditation and reflection with only one true path to the center. Visitors can take the challenge free of charge, working their way around the shrubs, where a stone Rappite temple awaits at the center. For those lacking patience, gates allow for a shortcut directly to the temple. In a pretty area surrounded by the Hoosier National Forest, French Lick Springs Hotel (1901) and West Baden Springs Hotel (1902) have been restored to their former glory, back to the early 20th century when they catered to society’s elite. Guests came here for the supposedly curative mineral waters from the natural springs. The Cook family of Bloomington has invested over $600 million in the restoration of both hotels, which is the largest privately funded restoration in U.S. history. 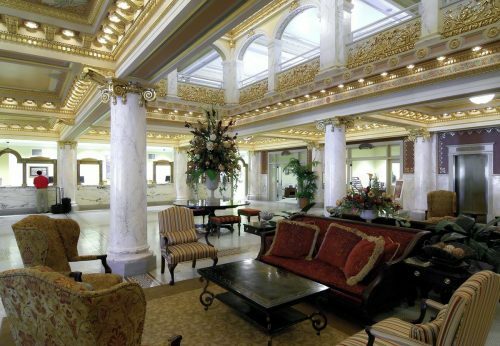 The French Lick Springs Hotel lobby is adorned with marble, gold leaf, mosaic floors, crystal chandeliers, potted palms, ceiling frescoes with Roman gods and vintage photos of early postcards. At West Baden Springs the lobby sprawls under an eye-popping, six-story domed atrium, the largest freestanding dome in the world at the time. Sit in this vast sea of space or go out on the expansive porch and relax in a rocker. Indiana Landmarks gives 70-minute tours of the hotels’ public rooms. The French Lick West Baden Museum tells the area’s resort and circus history. See an elaborate diorama of 1920s Hagenbeck Wallace Circus, Ringling Bros. Barnum & Bailey’s main competitor. Learn about boxer Joe Louis, who came to the French Lick area to train, as did the Chicago Cubs, who trained there the years they went to the World Series. One cannot talk about Indiana history without mentioning Abraham Lincoln and his connections to the state. Between the ages of 7 and 21 Lincoln lived in the Little Pigeon Creek area of Southern Indiana, where he developed a love of books and confronted life on the frontier. The Lincoln Boyhood National Memorial is on land where his father built a 160- acre homestead. The museum building/visitor center has exhibits and a 15-minute film on Lincoln’s life in Indiana. 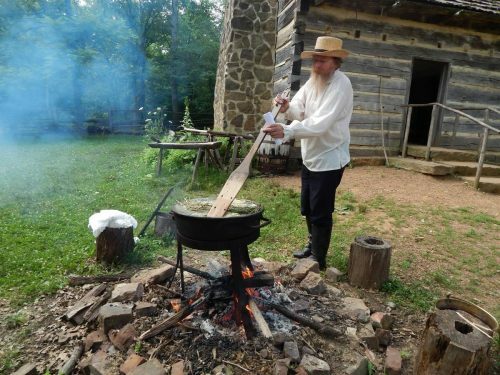 At the site’s living history farm, with its split-rail fences and buildings from the 1800s, visitors can view demonstrations of woodworking, cooking and other pioneer skills. North to south, Indiana abounds with remarkable historical landmarks that capture the state’s storied past.